Have you dreamed of a F1 Grand Prix trackside experience? Well now you can enjoy it at the upcoming Monaco Grand Prix. My Yacht Group is offering a fabulous 4 Day Trackside Superyacht Experience at the 76th Monaco F1 Grand Prix. Now in its 13th year, My Yacht Monaco is an exclusive 4-day experience during the Monaco Formula 1 Grand Prix. This incredible VIP experience is held this year from May 24 to 27. Their private superyacht is moored in a prime trackside berth, located on the Quay des Etats-Unis straightaway. This superyacht will provide the most luxurious platform for an unrivalled weekend of F1 racing in Monaco. Discerning HNW (High Net Worth) guests and luxury brand partners will enjoy an extraordinary weekend of F1 race viewing and luxury hospitality. Therefore all the action is aboard a private yacht that’s moored in a prime trackside berth on the prestigious Quay Kennedy straightaway. This locale is the Park Avenue / Rodeo Drive / Knightsbridge equivalent of yacht ‘parking’ during the exciting, 76th Monaco Grand Prix. My Yacht guests watch all of the F1 racing action from on board Thursday, Saturday and Sunday. Be treated to sumptuous foods, including caviar, and open bar throughout with premium spirits, fine wines, and champagne. Plus breakfast, lunch and afternoon tea are all served while the cars jostle for position only a few yards away. 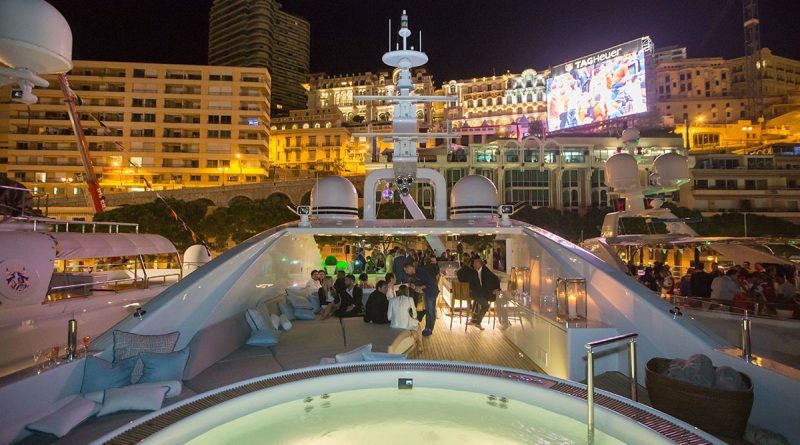 In addition, My Yacht Monaco’s annual Friday night Royal reception and party traditionally welcomes an international “who’s who” of the Grand Prix weekend. VIP guests will include astronauts, Olympians, actors, models, musicians and more. Also note that HSH Prince Albert II of Monaco has been known to grace the proceedings with his presence, too! The My Yacht party is renowned for “connecting the world’s most interesting people”, from 8:30pm – 1am on Friday night. Simply stated, it’s “the place” to be in Monaco! The 4-day experience is priced at just €8,500 per person / €16,000 per couple ($10,455 / $19,680 U.S.) for all on board hospitality and F1 race viewing. In addition, a la carte options are also available. Space aboard the superyacht is limited to jsut 75 daytime guests to ensure maximum comfort and exclusivity. Accommodations, flights and all 3rd party services are extra. – 13th annual My Yacht Friday evening reception with distinguished guests, heads of industry, innovators, Olympians, celebrities, models, and in many years honored by the presence of HSH Prince Albert II of Monaco. While the circuit is in use, access to My Yacht is by water only and guests are whisked to and from the yacht. This luxury yacht provides high-powered speed boat tenders and offers fabulous views of Monaco, and the harbor. This luxury yacht is capable of reaching 60+mph on the water. it’s simply an exhilarating ride! In addition, each guest receives custom, limited edition My Yacht gifts, plus a lifetime of incredible memories. – Plus so much more! – Non-yacht events even include My Yacht Club at the USA F1 Grand Prix in Austin, TX. My Yacht Group offers turnkey, luxury hospitality and branding opportunities on board private superyachts at premier international sporting, social and artistic events. If you want to make your dream come true, attend the upcoming Monaco Grand Prix in VIP style. We love sharing the best in luxury and offer a variety of VIP access and event opportunities. Please contact us today!